I came back to Dubai earlier this week after a 20 day long vacation in Mumbai. It was good fun meeting family and enjoying delicious meals from my mum’s kitchen. How I miss it! I will start chronicling now on my travel diaries in the blog as well and this is the first of the many to come, let me know your thoughts on the same. The series will have my experiences while travelling to a destination and not necessarily a recipe to go with it. Again I am no expert at writing about travel but being a professional travel writer’s wife, I have come to love travelling even more over the years now. Going back to my trip to Mumbai, it was such a fulfilling experience when I cooked for my family one evening. I made some pasta, oats spinach tikkis and dhokla. Dhokla is popular Gujrati snack and quite nutritious at it too. Weight watchers can rejoice since this recipe goes easy on the calories too. The dhokla turned out much better than usual, must have been my grandma watching over me and giving her expert tips when she saw me mixing the batter or tempering the dhoklas later. I could see a glint of pride and her smiling ear to ear when I made the tempering and not get deterred by the crackling and popping of mustard seeds. This stuff used to always scare me and I had burnt my wrists a few times panicking over the popping mustard seeds in hot oil. How things change! We just looked at each other and that moment melted my heart, it was simply beautiful. In a mixing bowl, sieve the gramflour and add salt, eno, chilli, ginger paste and mix well. Add water, little at a time and blend all the ingredients together. The consistency of the batter needs to slightly thick and hence add water as per requirement. Do not pour all of the water instantly. Add oil and mix well, this helps give the batter a good sheen. Do not let the batter sit on the side for long after it has been made. In a steamer, boil water and add the batter to greased plates in the dhokla stands. Fill the plates with the batter only to half the capacity since once steamed, the batter will rise. Steam for almost 10-15 minutes with the lid on. Always set the steamer on medium heat, high flame will dry out the dhoklas and the end result won’t be soft and spongy. Just like we check cakes, use a toothpick to check if the dhoklas have been cooked throughout after 10-12 minutes. If the toothpick comes out dry, remove the dhoklas off the heat. Let it cool for a while and then un-mould them from the plates and cut them in diamond / square shape. To make the tempering, heat oil and add mustard seeds and cumin seeds. Once they crackle, remove from the heat and with a spoon spread it over the dhokla pieces. I wish I had curry leaves that day so I could have added them to the tempering but we were too lazy to venture out and get some. Aren’t holidays all about lazing around and not stressing over the little things ? Garnish the dhoklas with a generous sprinkling of freshly chopped coriander leaves, a pinch of red chilly powder and serve with green chutney and tomato ketchup. I also like garnishing with freshly grated coconut but again it was not available and we gave it a pass. This is one special post, for me this is not much about the recipe here but about my experience that one rainy evening in Mumbai spending some quality time with my loved ones. My mom tried baking this for the first time yesterday and WE LOVED IT! It’s my favorite post-tea-time snack once I reach home now. Yummy! 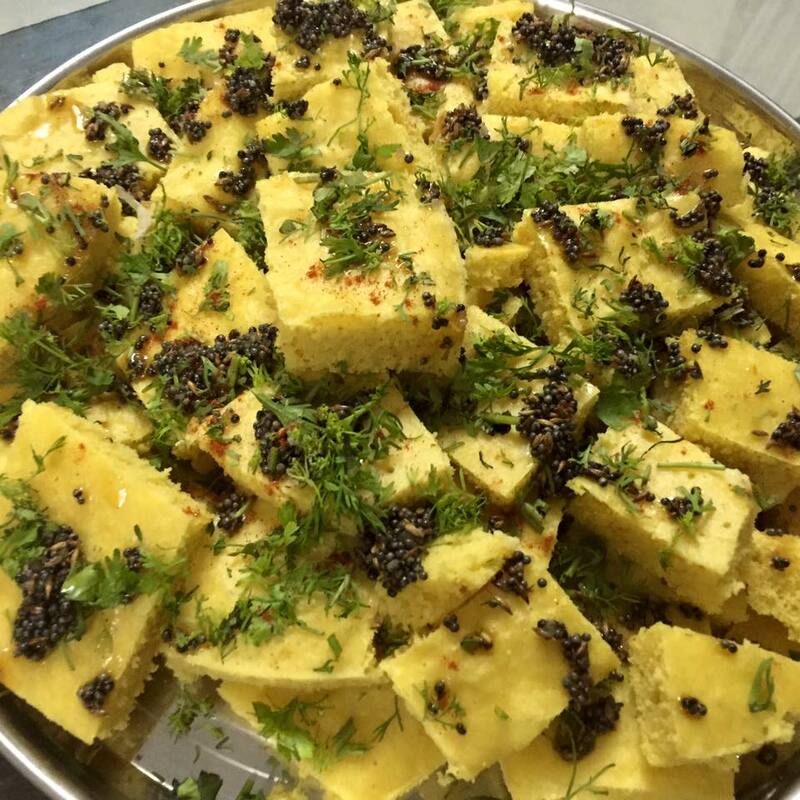 I love dhokla, and your post is making my tummy rumble! Thanks a ton for your kind words!